A view of the right side of the cytopharynx showing the groove and its associated microtubules running longitudinally along the groove (for cross sections see Allen, J. Ultrastruct. Res. 63:64-78, 1980, Fig. 4) and bundles of postoral microtubules on its cytosolic side. 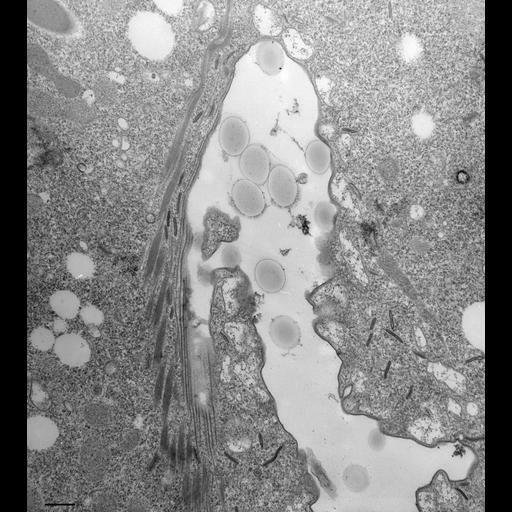 This cell was fed latex beads and treated with DMSO and then incubated in DAB so that discoidal vesicles appear electron opaque. Some discoidal vesicles can be found along the longitudinally oriented microtubules of the groove. The nascent food vacuole has many acidosomes docked at its surface even at the right side of the cytopharynx. TEM taken on 9/14/82 by R. Allen with Hitachi HU11A operating at 75kV. Neg. 8,500X. Bar = 0.5µm.